The Andrew Olson house was one of the first houses built on a hill overlooking Farview Park in North Minneapolis. Andrew Olson was a son of Olaf and Amalia Christina (Nesberg) Olson. He was born on June 11,1857 in Brunflo parish near Osterlund, Sweden. He emigrated to Minnesota in April 1882. In 1885 he opened up a merchant tailoring shop at 1007 Washington Avenue North which later moved to 235 Nicollet Avenue. 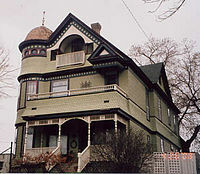 In 1886, the house at 2635 Lyndale Avenue North was built. In June 1888, Olson married Lydia Anderson Lindell who was born in Odensala Sweden near Osterlund. In 1902, Mr. Olson became a partner of A.A.M. Carlson an expert clothing salesman and they sold both clothing and household furniture. Andrew and Lydia had three children, Bertha Amalia born 2/28/1889, Carl Andrew born 8/3/1890 and Ellen Christina born 4/23/1897.